I really like most of John Green’s books; so naturally, I was looking forward to Paper Towns. The Fault in Our Stars, I thought, was pretty well done, and I was interested to see what direction they’d take this vastly different story. For the most part, the tale translates well from page to screen. After going through high school as quickly and quietly as possible, Quentin’s life is shaken up when his childhood crush, Margo Roth Spiegelman, invites him to take part in a midnight quest for revenge. The next day, Margo is found to be missing, and Quentin takes it upon himself to track her down. Paper Towns is an entertaining coming of age story, even if it does feel a bit rushed and underdeveloped. It’s nothing we haven’t seen before, and the message doesn’t translate nearly as well on the screen, but that doesn’t mean you can’t have fun with it. One of the most entertaining parts of this movie is watching the three main friends (Q, Ben, and Radar) interact. All of their dialogue, facial expressions, and overall flow of conversation is completely believable for three high school teenagers. Nat Wolff already impressed me as a comedic actor in The Fault in Our Stars, but whoever found Austin Abrams (Ben) and Justice Smith (Radar) needs to be awarded in some way. When I watched these three interact, it was like watching me interact with my high school friends. 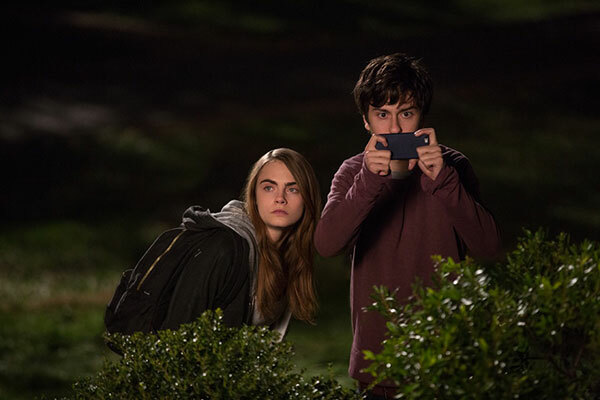 Cara Delevingne as Margo and Nat Wolff as Quentin. Halston Sage and Jaz Sinclair do their best as Lacey and Angela respectively, although I would have liked to see more from their characters. However, the true lead actress of this movie is Cara Delevingne. Seeing as Delevingne was highly successful for her modeling career and a seemingly inexperienced actress, I wasn’t exactly optimistic when I first heard she was cast as such a complex character like Margo. However, within the first twenty minutes of the movie, she quickly proved that she was far more than capable of taking on such a role. In all honesty, she might have been the best act in the entire movie. There’s no denying it: Cara Delevingne has a solid acting career ahead of her. The other thing this movie does well is harping on all the points of a typical coming of age story. The plotline is funny and endearing, making it a clever addition to the high school drama genre. Sure, older audiences probably won’t love it, but if you’re a teenager or a fan of the book, there’s plenty in Paper Towns to relate to and enjoy. The whole movie had kind of a John Hughes Ferris Bueller feel to it, and that’s pretty cool. While Cara Delevingne is an outstanding addition to the movie, she’s not in it nearly as much as she should be. I understand that this is by design, considering both the book and movie focus on Q, but I would have liked to see more of her character and learn more about her. And while Cara Delevingne and Nat Wolff are both serviceable acts, they have absolutely no chemistry whatsoever. Any chance for romantic tension between the two is completely lost when they interact. It’s honestly a bit painful to watch. In other character flaws, Halston Sage and Jaz Sinclair are both under-utilized, and are essentially only present when the plot calls for it. Unlike their male counterparts, they aren’t given the same opportunity to be developed as characters. They both have one monologue that tells the audience who they are as people, and then they’re pushed to the side in favor of the three male leads. Now that I think of it, character development as a whole is huge issue in the movie. Those who’ve read the book will tell you that the story is a slow burn; with most of the character development happening in the shifting through clues and quiet conversations in the van in the third act. But since those parts wouldn’t be interesting enough to stick into a movie, the majority of conflict and development is pushed towards the last fifteen or twenty minutes of the film. It gives everything this feeling of being rushed, while at the same time not moving along fast enough. While the story is satisfying, we don’t get to truly know the characters until the ending, and in a movie like this, that’s a shame. If nothing else, Paper Towns is a fun little movie with some pacing issues. If you’re still in high school or you’re a fan of the book, I’m sure you’ll enjoy it, but everyone else will be left wondering what all the fuss is about. It’s not nearly as polished as The Fault in Our Stars, but it’s a decent coming of age film that will at least make you smile. What did you think of Paper Towns?